You have tried everything you can think of to make learning more enjoyable and exciting. You have checked sight, you have checked hearing, and still you see confusion and frustration. 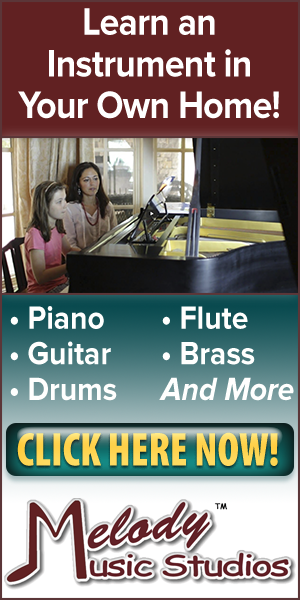 You may notice there is no longer the eagerness in your child to just keep trying. When children begin to struggle especially from around third and fourth grade on, you need to understand the three main reasons that cause a lack in learning capacity when there is no physical reason. It is easier to understand what is happening if we look at a three-legged stool in which these three processes are labeled. Please note this is simplified for easier understanding. When each leg is the same length, they can easily support learning. These three processes interact with one another, none stand alone; however, each have their own specific function as well. The information shared between them via messages sent to and from the brain, creates the capacity to learn and master information. Visual processes include the visual seeing system: Seeing with the eyes, visual balance, spatial understanding, and reading of color, shape, and symbol information, as well as planning. Mental picturing is inside the head, referred to as inner vision or imagination seen with the mind’s eye on the mind screen in the mind. When picturing is inside the head it comes as a result of the the mind’s eye projecting information on a visual screen for working memory, usually straight out in front, most people must close their eyes, though some can see and access information with their eyes open. The visual screen for long-term memory recall is up to the left, up in the middle, or up to the right. When eyesight and mind’s eye work correctly together and not in conflict one with another there should be no issues with visual processing for academic understanding. 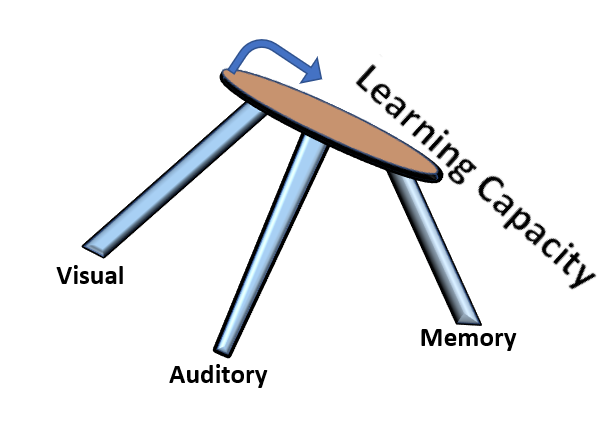 Auditory processing is made up of the whole auditory system of hearing and balance: Hearing includes perception and recognition of auditory input and includes sound coming into the ear and includes pitch discrimination, monitoring loudness, spatial sound (near or far, left or right, up or down), and discriminates between language and noise. Auditory processing of sound frequencies includes creating the neural network for languages and music for receiving and expressing thoughts in language. The second part, the vestibular system within the ear, recognizes and sends balance information to the brain. Memory Processing is the system used for the different kinds of memory storage and memory recall. There is a buffer memory 0-3 seconds of time, just long enough to get attention but not long enough to keep the information. At 3 seconds, concentration can begin and if there is sustained focus, information may begin to be understood. This information may then be used in working memory to logically figure out a solution or to use within a short period of time. When information is seen, heard, or experienced and totally understood — no confusions — it can enter long-term memory. Long-term memory can then be recalled for later use. 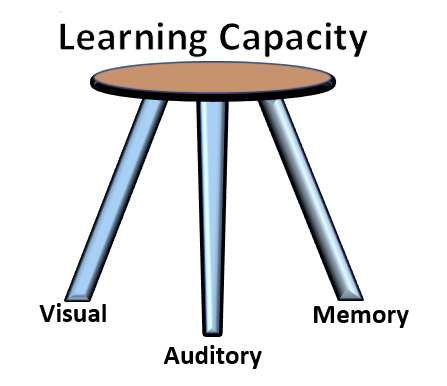 See how learning capacity falls off when there is a lack in any or all these areas? If any leg is too short, the top of the stool will tip, not allowing the full support of the weight and capacity of learning. Often students begin to learn easily but as they progress into higher education, where more is expected, they may begin to lose their excitement and seem like they are not as interested in learning. This may be an indication that there is a lack in one or more of these processes causing learning to fall off, as confusions and frustrations tend to multiply. We look at Memory Processing in this example. When, for some reason their ability to remember is insufficient, they may be referred to as having a memory deficit or attention deficit. If a child has no difficulty focusing on and staying engaged on a subject or activity they enjoy, then they do not have a focus problem but a memory capacity problem. In such a case we must teach them how to remember. What we need to look at is the digit span: How many pieces of information can be received either through site or by hearing, held for a short period of time and then recited or written sequentially correctly. 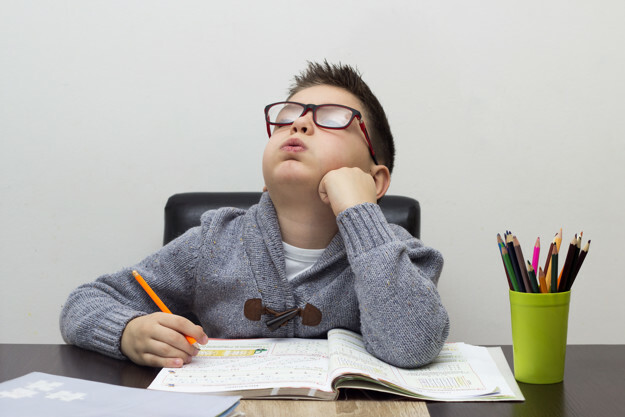 When that span of memory is too short the child will not be able to retain information long enough to use it in short-term or working memory. If it seems they are having difficulty remembering and their enthusiasm for learning has slowed to a near standstill, it is time to check their Digit Spans and help them expand their ability to remember. A child receives one-unit space of information for each year of age, so a five-year-old should have an auditory digit span of five, a six-year-old six, a seven-year-old seven, and then that ability to add units stops unless it is pushed to open further units for information. Most adults have digit spans of 7-9. An easy way to check the auditory digit span is to say individual numbers starting with three, example: (say 4,wait one second then say 9, wait one second then say 1, wait one second then say “Write it”) and giving one number per second for them to hear and then one second to hold the information and then write down what they heard. If they can do that, continue to where they either leave one number out, put in a number you did not say or transpose numbers. That will let you know what their auditory digit span is, the last amount of numbers they can correctly and sequentially record. To check visually, you can use different colored cubes, Legos, or even M&M’s. Lay out a certain number, hiding what you are doing from them. You might hold a thick paper or anything they cannot see through, then move it away. After the cubes are laid out, have them look for as many seconds as there is information, then cover again and have them make the same sequence. Check to make sure there are not inserted colors where they should not be, or ones in an incorrect place. Continue till they make a mistake. Where they make the mistake, you will know it is too hard for them, so back up one amount and that will be their visual digit span number. If you find your child does not have a digit span the same number as their years, you will want to help them enlarge the span, so learning can be easier for them. These products expand the Digit Spans. EFSAP Memory Program, designed for Occupational Therapists and Parents at home with videos for all the exercises so the one presenting the exercises will know exactly how to perform the exercises.